At the zoo (a.k.a. 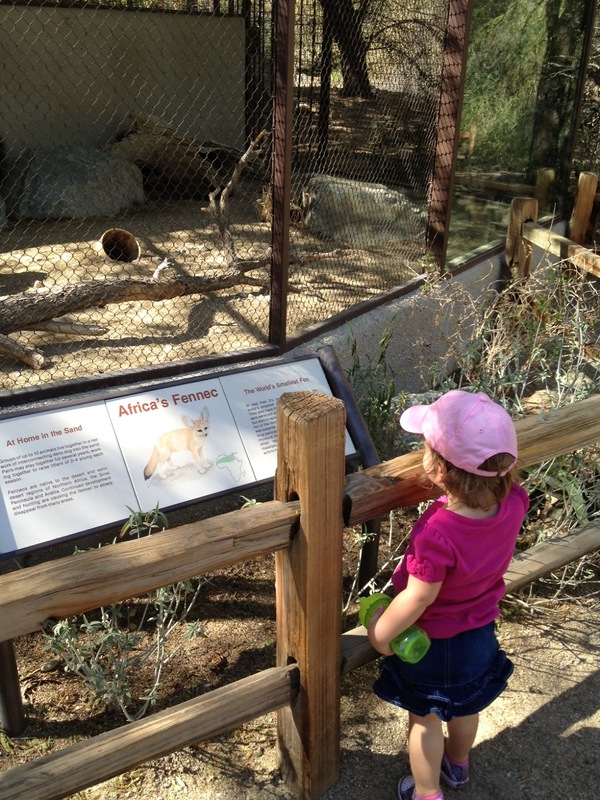 "living desert"), enthralled by the FENNEC. Well, like I said, we eventually made it to Palm Springs. We were a tad on the sleep-deprived side on that first day, but we had lunch at the golf club and Charlotte refrained from embarrassing us too badly. It was super windy, so we nixed swimming, and Charlotte was none the wiser. The next day, one of my best girls, Nancy, drove up from L. A., along with her husband, Dan. I looooooooove Nancy and Dan, and it was such an awesome, unexpected surprise when I learned they wanted to visit. They met Charlotte for the very first time, and brought her a doggy balloon (with slightly weighted legs and feet that made it look like you’re walking a dog as you pull it). Dogs and balloons are two of Charlotte’s favorite things IN THE WORLD, so Nanners and Dan secured themselves on her list of favorite people. Forever. On Tuesday, it was perfect weather for swimming, so Charlotte, Omi, and I basked in the sunlight and pool. Charlotte proved herself to be quite the swimmer, and when Daddy joined us in the pool, she LOVED being thrown up in the air. She laughed and laughed and wanted more more more! Daddy got tired. Well, there were plenty of stuffed fennecs left, as the normal children go for the giraffes and leopards. Nobody but our strange child would want a fennec. So, we bought the ugly thing and proudly presented her with it outside the gift shop. Charlotte’s face lit up. She reached for the fennec and clutched it to her chest, breaking her fear of stuffed animals. We even had to haul it on the plane rides home. That was fun. In addition to pool time and fennecs, Chris and his dad played golf two days. Chris loves to golf, and he especially loves to golf with his dad, so this was quite the treat for him. I worked a bit (it’s true), hung out with Chris’s mom and Charlotte, lazed by the pool (as much as you can with a 2-year-old), and tried to keep my child from breaking things in the condo. We also hit a lovely Italian restaurant, where Charlotte—so stinkin’ adorable her sundress (I miss sundresses! Come on, spring! )—occupied herself throughout multiple courses with a single half-lemon. God bless citrus. On our last night, she gorged on chips and salsa at a Mexican restaurant, happily munching and dancing in her chair to the mariachi music playing. As my father-in-law said, taking her to a restaurant is easy: just ensure you have food (or a lemon) in front of her at all times. While this is true, she did manage to dump her entire cup of water (despite its lid) on herself, so she donned merely a bib and a diaper cover (and cute shoes, of course) for the remainder of the meal. Our trip was short, but worth the travel trouble. It was swell to see Chris’s folks, and especially to give them an opportunity to see their brown-eyed grandgirl. Charlotte warmed up to them immediately, and wanted Omi to carry her everywhere. Of course, Omi obliged. The trip home was uneventful—everything ran on time. We went to work the next day, totally out of it, and after seeing all those retired folks in Palm Springs, we realized that WE SHOULD JUST RETIRE.